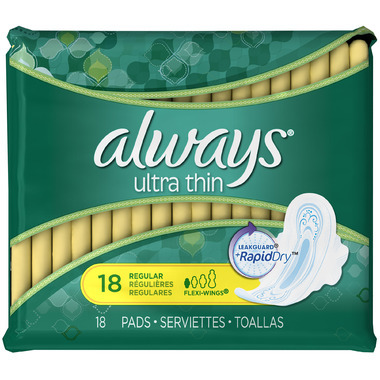 Always® Ultra Thin sanitary pads with Flexi-Wings flex as you move, helping them to stay put for great protection against leaks. Always Dri-Weave™ Cover provides soft, dry protection and the LeakGuard™ Core Plus Barriers pulls fluid deep into the core and away from the edges. Use Regular absorbency for days when your period flow is moderate. A very good product. This is the only brand I buy anymore. Wings is the only type of pads I purchase. The leakguard on this product is like no other product that is other. It's thin vs. other makes a bulky and uncomfy when wearing it. Always is my go to product over other brands. This is the only brand we use - nothing else works quite as well. With pads makes that difference in those days to allow me to not worry! I would never buy a pad without wings. I love these for regular days! Always with wings makes all the difference during my period. They're a great change from tampons, and the wings ensure no leakage.